The Spanish courses at our school in Santiago de Compostela, Spain, offer students the opportunity to learn Spanish in this beautiful city, and also explore North-West Spain - an area so far undiscovered by mass tourism. Learning Spanish here, it is also much easier to mix with the locals and make friends. Also, as Santiago de Compostela has a large university, this historic city offers a wide range of facilities to cater for students - whether foreign students on Spanish courses at our language school, or Spanish students at the university. Santiago de Compostela (pop. 90,000) was declared a World Heritage site by UNESCO in 1985. The architectural beauty of the city is simply awe-inspiring, with innumerable palaces, monasteries, squares and historic buildings from every century of the last 1000 years - a wonderful location in which to immerse yourself in Spanish culture and learn the Spanish language. Santiago is also the cultural and administrative centre of Galicia, with numerous music concerts, exhibitions and festivals held throughout the year, as well as being an ideal base from which to explore the natural beauty - the beaches, valleys and mountains - of North West Spain. Our school in Santiago is located in the historic centre, just 5 minutes walk from the cathedral. 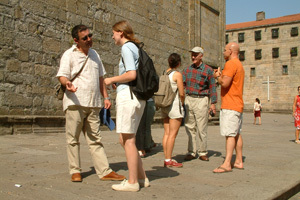 The Spanish courses take place mainly in the mornings. The school also offers courses for mature students - Spanish Club 50+. For further details see below. Fly to Santiago. Airport collection available.